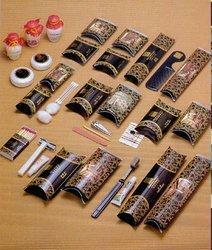 We are exporter of Infilight amenities kit for promotions in airlines , currently supplying to Egypt airlines. Our Guest amenity kits in transcontinental First Class contain the fabric lining, socks and eye mask with airline branding, a toothbrush and toothpaste, earplugs, shower gel, soap, shampoo, face wash & Hand Sanitizer. We are a reckoned name, which is engaged in offering an unmatched range of Amenities Kit. The offered range is available in different customized specifications and forms in accordance with the diverse requirements of clients. Guests always want to be pampered. Our range of branded and non-branded amenity kits and accessories gives you complete freedom in getting the right combination to suit your image and budget. So, along with the pampered guests come pampered pockets. With the endorsement of our adept and seasoned professionals, we are engaged in offering a commendable range of Hotel Guest Amenities. Shampoo, conditioner, moisturiser, shower gel. We offer Best quality of Hotel Amenities to our customers. Our products are prepared with high-grade essential oils & herbs that are grown organically & picked only at certain times of the day when they are at their most potent. These products are prepared in accordance with worldwide quality standards. Our reputed entity is engaged in supplying Hotel Amenity Kit. Backed by rich industry experience and market understanding, we are involved in offering a wide array of HOTEL AMENITY KIT to our valued patrons. We are devoted towards providing the qualitative range of Health Care Kit. Dental kit: with toothpaste and a toothbrush for complete dental care.